The Santa Cruz Police Department patrols downtown as people dressed in costumes walk along Pacific Avenue on Halloween night. There was a large police presence to enforce laws, including increased fines in what the SCPD declared a “triple fine zone.” Photos by Morgan Grana. 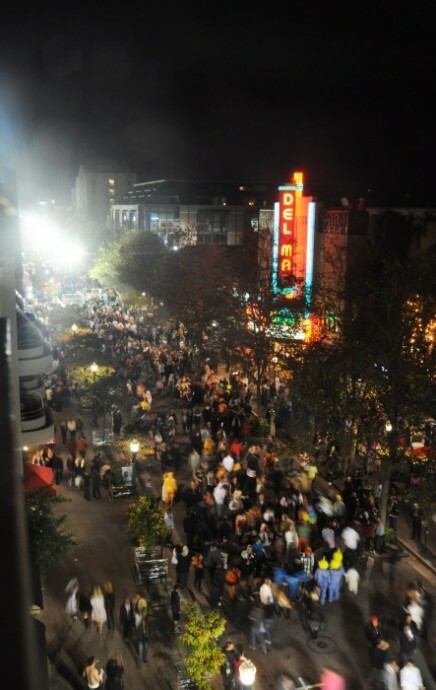 Fifty total arrests were made in downtown Santa Cruz on Halloween night, and 49 triple fine municipal code violations were given. Of the arrests, 34 were for public intoxication or otherwise alcohol-related. To discourage public disruption during the unofficial Pacific Avenue Halloween parade, the Santa Cruz Police Department announced on Oct. 26 the downtown area had been deemed a safety enhancement zone for designated Municipal Code violations. The fine for possession of an open alcohol container was $480, and a ticket for urinating in public $576. The SCPD teamed with nine allied law enforcement agencies on Oct. 31 to enforce local laws and identify and contact suspected gang members downtown during the evening. Santa Cruzan Brandy De Vincentz saw a group of “kids” stopped by police officers downtown that night. The officers confiscated a bottle from the group, and asked them to line up against the wall and produce their IDs. The SCPD begins preparing for Halloween up to six months in advance. 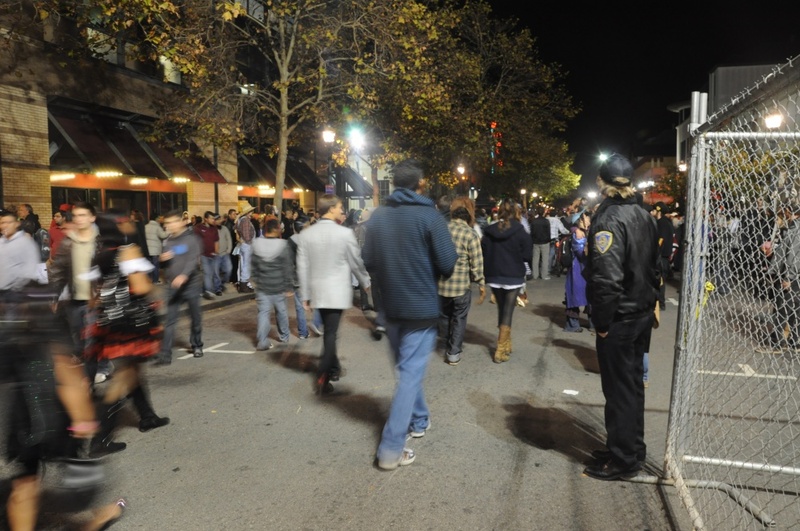 To make sure downtown Santa Cruz remained a safe environment on Halloween night, SCPD worked with UC Santa Cruz, downtown businesses, the Santa Cruz Fire Department, Parks and Recreation, Public Works, localized law enforcement and ambulance services. “The number one thing is moderation of alcohol — so many bad decisions are made when intoxicated that reducing the amount you drink on Halloween greatly improves safety on that night,” Friend said. Arrests were made for domestic violence, possession of a concealed weapon, possession of a switchblade knife, drug possession, parole violations/warrants and resisting arrest. One unloaded handgun, one switchblade knife and two pellet guns were removed during the evening. The SCPD also responded to a significant number of party-related calls that evening, according to Friend. The department reports fielding 347 calls for service during the evening, a 75 percent increase over last year’s call volume. “Overwhelmingly these calls, especially later in the evening, were for parties and issues (such as fights) stemming from the parties,” according to the Nov. 1 release. The SCPD and the UCSC Police Department scheduled a round of party patrols for Friday and Saturday nights preceding Halloween. The focus of these patrols was “large and out-of-control parties in Westside Santa Cruz neighborhoods,” according to UCSC Public Affairs. Previous party patrols performed by the Santa Cruz and UCSC police between September and October resulted in more than 60 citations, nine arrests, and 32 party hosts warned with their addresses flagged under the city’s “loud and unruly” ordinance. For the past three academic years, UCSC has provided money to the Santa Cruz Police Department to fund voluntary overtime for officers on the weekends to enforcement of the city’s “loud and unruly” ordinance and to respond to large parties, according to UCSC Public Affairs. Executive Vice Chancellor Alison Galloway approved a campus expenditure of $25,000 for the 2011-12 academic year to continue the partnership program with the city.